This sign is for Black Cat Pure Cigarettes. The sign’s colors are green, black, white, yeloow, and red. 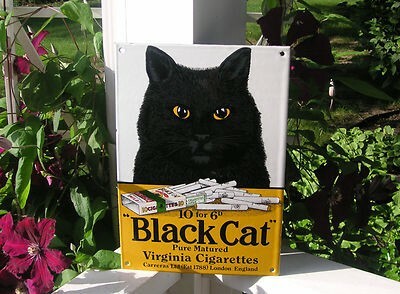 The text on the sign reads: 10 for 6 Black Cat Pure matured Virginia Cigarettes. The sign shows a black cat, pack of cigarettes, and text.